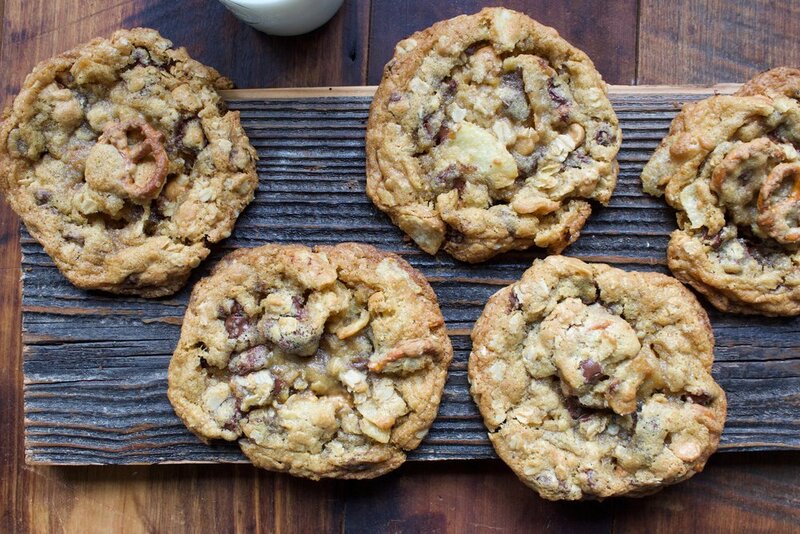 Ready to shake up your cookie-making technique? Ditch the baking sheet: you can bake cookies right on top of a parchment-lined Baking Steel, with superior results. Never have you seen the bottoms of cookies bake so perfectly; the sides and tops of the cookies are crunchy, with an irresistibly chewy interior. Plus, baking cookies on the steel shaves a few minutes off of the bake, which means you have cookies sooner! With a perfect texture, you need a flavor that is just as special. These cookies deliver. They contain what might sound like an unusual-sounding melange of mix-ins, including oats, chocolate and peanut butter chips, potato chips, and pretzels. But one taste will tell you that these are sweet and salty cookie perfection. Place your Baking Steel on the middle rack in your oven. Preheat oven to 350 degrees for 45-60 minutes. In a large bowl, sift together the flour, baking soda, and salt. Set to the side. In a stand mixer fitted with the paddle attachment, cream the butter and sugars until fluffy and light, 2-3 minutes on medium-high speed. Add eggs one at a time and beat until combined. Stir in the vanilla extract. Add the dry ingredients to the wet mixture in 2 batches and mix on low until just incorporated. Fold in the oats, chocolate and peanut butter chips, pretzels and potato chips. Chill the dough, right in the mixing bowl, for 30 minutes in the refrigerator. By the time your dough has chilled, the Steel should be perfectly heated. Place 4 ounce cookie dough balls, leaving two inches of space for the cookies to spread, on top of a sheet of parchment paper. Using a pizza peel, launch the parchment paper onto the hot Baking Steel. Bake for 12-14 minutes, rotating halfway through baking, or until golden-brown. Remove using the peel, and transfer the sheet of parchment to a wire rack to allow the cookies to cool. Store in an airtight container for up to 5 days, or freeze for up to 1 month.